San Juan Backcountry offers guided tours of the majestic backcountry in Silverton, Colorado. 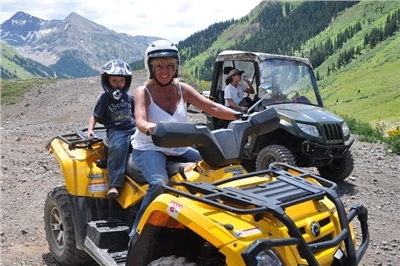 Whether you choose a 4x4 Suburban, an ATV, or a UTV, your guided tour will be just plain fun!You will enjoy spectacular scenery from 9,300 to 13,000 feet and learn about the area's history. Tour guides will take you to the best places to hike, fish and explore.San Juan Backcountry has been established since the 1990's and is one of the oldest touring companies in Colorado. The San Juan area around Silverton, CO is some of America's most pristine and beautiful wilderness. Although the mines of the San Juans are now silent, take a step back in time and experience what it must have been like to be a miner in these rugged mountains many years ago. The underground world of hard rock mining is rarely seen by outsiders. 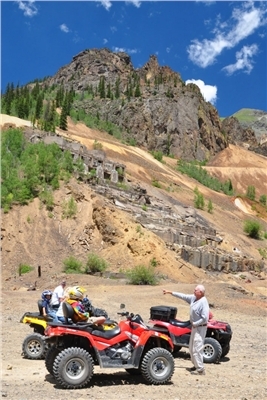 Come join San Juan Backcountry with a fascinating historical tour of Silverton, Colorado. You will begin at the San Juan Backcountry Headquarters. As you go through town, your guide will acquaint you with the historical sites along the way up to Cunningham Gulch and the Old Hundred Gold Mine. Sack lunch is provided at the mine, followed by panning for gold and silver. Pocket your treasures and shortly before noon you will "suit up" in rain gear for a tour of the underground mine workings; deep below Galena Mountain. The Mine Tour is from 12-1pm. After returning to the surface, you will continue the historical journey by viewing the Old Hundred Boarding House that still clings stubbornly to the high, steep side of the mountain. Don't forget your camera and binoculars! As you return to town, your tour guide will point out the Mayflower Mill and describe the way gold ore was processed in the late 19th century. Finally, you will be dropped off at Silverton's Mining Museum and its historic jail. (THE MUSEUM IS NOT INCLUDED, AND IS A SEPARATE FEE OF $8 PAID TO THE MUSEUM) You'll feel like you've stepped back in time as you view numerous historic artifacts. Slip into jail and feel what it was like to be "behind bars" in the old town of Silverton. Don't be late for your 2:30pm or 3pm train ride back to Durango! From 9318 feet in Silverton, to over 13,000 feet! That's where we can take you in the comfort of our open-topped suburbans. One hundred years ago these same roads were used by miners and mail carriers, businessmen and thieves. Come experience the beauty and serenity of a mountain range heralded as the most beautiful in the world, the San Juans. Let our professional drivers treat you to a day of spectacular scenery and history all rolled into one. Come take a 4X4 tour with San Juan Backcountry. Our 4X4 tours run May through October. From 9318 feet in Silverton, to over 13,000 feet! That's where we can take you in the comfort of our open-topped suburbans. One hundred years ago these same roads were used by miners and mail carriers, businessmen and thieves. This tour will take you to the Ghost Town in Animas Forks once inhabited by the miners and their families. Come experience the beauty and serenity of a mountain range heralded as the most beautiful in the world, the San Juans. Let our professional drivers treat you to a day of spectacular scenery and history all rolled into one. 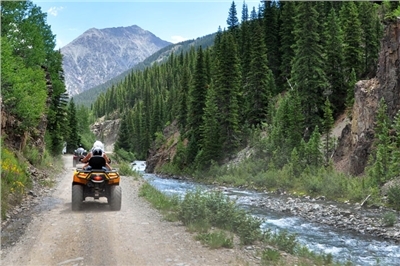 Come take a 4X4 tour with San Juan Backcountry. Our 4X4 tours run May through October. From 9,318 feet in Silverton, to over 13,000 feet! That's where we can take you in the comfort of our open-topped suburbans. Come experience the beauty and serenity of a evening mountain range heralded as the most beautiful in the world, the San Juan Mountains! Children 12 and under. From 9,318 feet in Silverton, to over 13,000 feet! That's where we can take you in the comfort of our open-topped suburbans. Come experience the beauty and serenity of a evening mountain range heralded as the most beautiful in the world, the San Juan Mountains! San Juan Backcountry offers guided tours of the majestic backcountry in Silverton, Colorado. 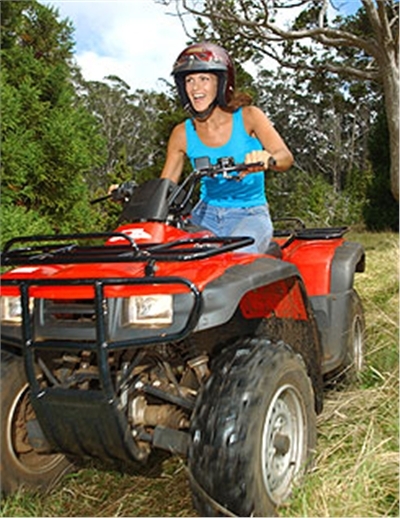 Whether you choose a 4x4 Suburban, an ATV, or a UTV, your guided tour will be just plain fun! You will enjoy spectacular scenery from 9,300 to 13,000 feet and learn about the area's history. Tour guides will take you to the best places to hike, fish and explore. San Juan Backcountry has been established since the 1990's and is one of the oldest touring companies in Colorado. The San Juan area around Silverton, CO is some of America's most pristine and beautiful wilderness. San Juan Backcountry is located at 1119 Greene St., Silverton Colorado, which is the main street in the town of Silverton. Cancellation | 48 Hour in advance of your scheduled tour required. Other | 48 Hour in advance of your scheduled tour required.